For this month’s Branch Out Reading Challenge, the category was a classic Christian voice. I didn’t hesitate to pick C.S. Lewis’s A Grief Observed. It was already sitting on my shelf because a good friend bought it for me, but when I started it back then (a year or two ago), I only made it a couple pages in. Too painful. And it’s been on my shelf ever since. The power in this book is how raw and real it is. C.S. Lewis was in the middle of his grief over his wife, and he is hurting. The pain is palpable. But I’ll be honest—it was almost too much. Because the beautiful thing it showed me is that, at this moment in time, I’m not feeling that depth of pain. I miss my mom tremendously, and those feelings have been especially strong recently, but this July it will be five years since we lost her. No, time doesn’t erase the sadness. But it does temper it somewhat. I still have moments where it jumps up and overwhelms me. But I also have some where I can laugh about something annoying she did. And it doesn’t feel as though I’m dishonoring her. There were lots of parts in the book that I marked, but one section in particular pretty much stopped me in my tracks. It was only four pages into the whole book (which, admittedly, is rather short.) Lewis put into words the ultimate fear I felt after Mom died. And that truly encapsulates the thoughts I dared not voice. I always believed God was there, that God was God. I did not waver, even in my most alone time, even as I felt like I was drowning in my grief. But I was terrified that He was not who I wanted Him to be, not who I thought He should be. I was afraid that His idea of what was good and true and right was drastically different than mine. That I had put my trust in someone I didn’t like or couldn’t rely on. That He just wasn’t good. That was the root of my devastation. Because I need God. I need Him to be my strength, my compass, my motivation and inspiration and truth. 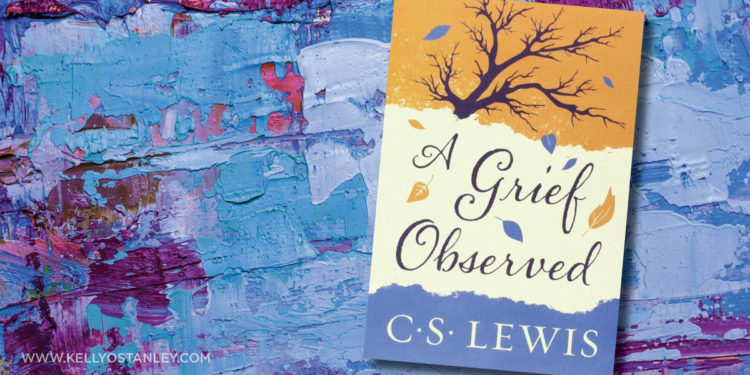 Like Lewis discovered, the only salve for this gaping wound of grief is God. But I had to be willing to seek God for who He is, not for what He might do for me. He had to be the end of what I sought, not the means of getting there. Hmm. I may want to re-read Dani Shapiro’s memoir, Devotion. But I really don’t know. I know there are a lot of different beliefs, and I’d like to branch out to something new. I’ve enlisted Google to help me find some options. They don’t have to be memoirs, but I tend to love those, so I always lean a little bit in that direction. Do you have any recommendations? Can you help me? I often wondered and honesty still do, where was God when my stepson molested my daughter? I can not grasp the concept that God will use this for good somehow even though the is what I tell her. Having a hard time with thoughts that go through my head of death and hurting another human being. Where was our God when my baby was being hurt? It has been over a year and the pain is still so sharp that it cuts us both to the bone, to the very center of our beliefs .